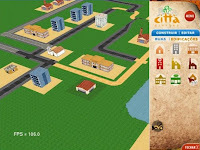 Civitas is a project of a colaborative educational game, where children from schools can cooperate in a network for the construction of cities. This sounds/looks like a multiplayer OpenCity. Civitas is a GPLed project written in Java. Thumbs up to kid/education-related game projects whose creators are brave enough to use standard free licenses! Clippers is a board game designed by Alan R Moon that is an abstract island connection game based on clipper ships and the south pacific. 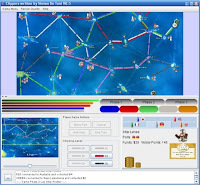 This computer version is written in Java 1.5 and includes AI players. FreedroidRPG 0.12.1 has been released [download]. The main game map has been re-organized to make more plot-sense. It does, but too many gameplay-useless rooms full of stasis chambers have been added. To my feel, the game is now a lot harder too. However, the controls feel slightly better compared to the last time I tried it. Unfortunately I experienced annoying laggy map-loading and a few crashes from playing too many sounds at once (might have to do with my sofware mixer though). Check out the full changelog for more details. I noticed that FreedroidRPG's image sources (.blend and .svg files) have been uploaded. an unsorted heap of everything visual that is used in the game [archive tree]. I must say that I like the graphics much better in high resolution. 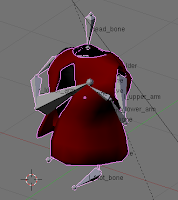 3D game developers eying this pack will be glad to hear that everything that needs rigging is rigged. For 2D game devs, there is a rendering guide. Cheese Boys [remember?] is still in development - and still looking for artist help... though maybe someone to scout OpenGameArt would even be enough?.. Ardentryst is being constantly developed - the 1.7 release was added three weeks ago. Radakan 0.0.1, which can be currently described as "young Qt GUI-driven text RPG", was released. Future plans include graphical clients and such. Creating a system to allow writing the story/gameplay before starting work on a graphical engine is a playing-it-safe decision. IMHO a good idea. The WorldForge client Ember now has real-time shadows [announcement]. By the way, WorldForge is in the Google Summer of Code 2009. [GSOC page] as are some other game or gamedev-related projects, as seen in this list. 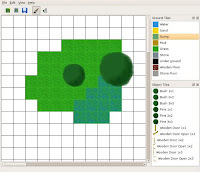 Dungeon Mapper is yet another tile map editor. Mokoi Gaming 0.4 was released. It now supports OSX and contains a Tetris variant [changelog]. The two-day game programming competition Ludum Dare #14 has ended a while ago. Unfortunately nobody except arcticum's and Flood of Air's authors cared to release their game as open source software (or I couldn't find them). Armagetron Advanced 0.2.8.3_rc2 [download] fixes color filters and crashes. [changelog]. I wouldn't fret too much over Ludum Dare. As a participant in past LD's, I can tell you that there isn't much one can do in 2 days that would make you want to copy the source directly. The submission guidelines state that you must include source, so if you are wondering how someone did something, you could always have a look and implement it yourself. Still, it would be nice if more people released their code under FOSS licenses to increase awareness. Particularly since I have found that LD is in general unfriendly to Linux (few games will work with it) and perhaps by association unfriendly to FOSS (well, only two games got a FOSS license, right?). The latest PyWeek is about to end, by the way. I see Radakan isn't described yet as fun to play... presumably it's meant more as just a demonstration release than anything meant as a playable game. Sslaxx: pretty much, I'd say.